Mass Effect: Andromeda just won the 2016 Golden Joystick Award for Most Wanted Game. 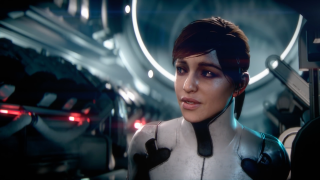 It appears the distinct lack of Commander Shepard, Liara T'Soni, and the rest of the Normandy crew isn't enough to deter fans from getting hyped about the next game in the Mass Effect series. Massive RPGs always seem to draw in tons of excitement from gamers. Maybe it's the promise of exploring a vast new world, the rich storytelling, or the variety of things you can do in them. Andromeda certainly has all of the above, with an entirely new galaxy to experience, a studio known for its well-written characters, and new gameplay like the Nomad rover vehicle and jetpacks. Fallout 4 took home the 2015 Golden Joystick Award for Most Wanted Game, and it turned out to be a pretty good game. Now the pressure falls to BioWare. Don't let us down!